BAGUIO CITY – Surrounded with pine-covered mountains, a cool climate breeze averaging 18 degrees Celsius all year round, residents and visitors alike can take time to bask in romantic sunsets enjoying a casual stroll along tree line roads on what used to be an American rest and recreation camp. 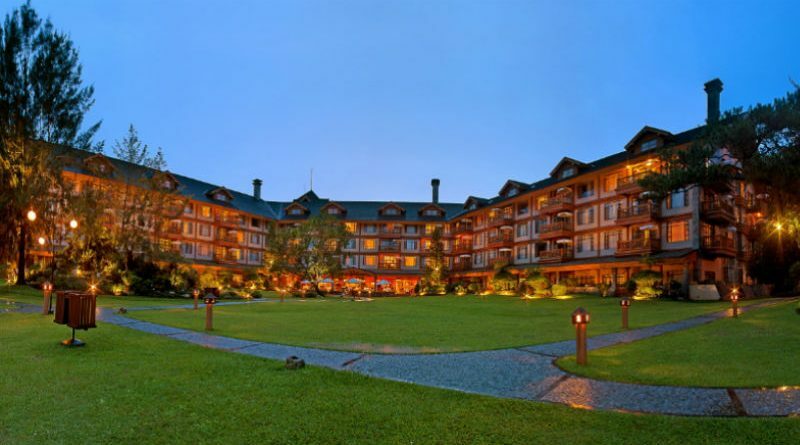 The allure of the Manor at Camp John hay is unmistakable. At 5,000 feet above sea level, the Manor is a splendid presentation of Baguio’s natural beauty and bounty and nestled within the 246 hectares of the city’s most beautiful track of prime land, the 4-storey structure was designed to blend seamlessly with towering pine trees while the majestic Cordillera mountain range provides a magnificent view. The Baguio stone exterior finish, shingle roofing and tinted glass windows lend a building a warm and friendly look. The manor is distinguished not just by its impressive architecture but by its cozy interior as well. Panelled walls and wooden furnitures evoke a Filipino –colonial feel and emulate the atmosphere, the history and the fun memories of the real Baguio. Wooden shattered doors open to outdoor patios with breath taking view. The manor is a veritable home-away-from-home that offers 169 rooms including 51 well-appointed suites and all the rooms are equipped with modern amenities such as wifi internet access, cable television, IDD or NDD phone system, a fully stocked refrigerator, hot and cold shower, electronic in-room safe, coffee and tea making and electrical outlet. The Manor continues to set world standards for first-class hospitality since it opened its doors for business and pleasure and guests can simply savor one of Baguio’s most cherished travellers’ experiences. However guests arrive, the Manor’s tradition calls for contemporary meals at the ground floor’s Le Chef restaurant with renowned Billy King at the kitchen’s helm and the restaurant has long been considered one of the most prestigious places to meet anywhere in the city. Le Chef at the manor offers a wide range of local and international dishes and fine wines. The nippy Baguio evening is the perfect excuse to unwind in the comfort of the piano bar, a cozy setting lounge beside the fire place at the lobby, where one can enjoy fine piano music while sipping their favorite cocktail to accompany light, savory hors d’oeuvres. People can also enjoy al fresco dining at the Greenhouse, with its stunning view of the garden. The newest addition to the manor where one can savor delectable dishes while appreciating crisp cool Baguio breeze and the majestic view of the Cordillera mountain range. Beside the restaurant is the Le Chef delicatessen, where the comforting aroma of freshly baked breads and pastries lace the air. The last-tasty, delicate morsels have become much sought-after delicacies that guests from Manila bring with them as gifts for family and friends. It is open daily, and also offers light snacks and a variety of cheeses and sausages. After an exhausting day at work, or from playing a round of gold, people can refresh their senses and pamper themselves with a massage, Jacuzzi or sauna at the Manor health spa or have a relaxing yoga session at the wellness studio. Guests can also avail of leisure packages including hiking in an eco-trail while the more adventurous can pitch a tent in a nearby campsite. It also has a butterfly sanctuary for those who wish to hold colourful butterflies with their bare hands and since Baguio is a horseback-riding country, Camp John Hay created Shalan ti Kabajo.